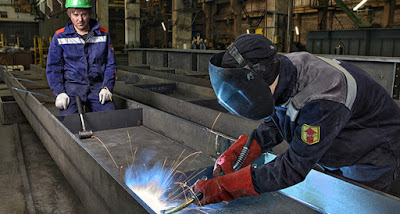 The person who operates welding equipment to connect metal components together using metal inert gas is called a Gas Metal Arc Welder. A very complicated yet challenging job as it requires 100% of your attention because of its dangerous super-heated metal. On the other hand, upon enrolling in this kind of course, we may get to know how to read blueprints, basic math, metallurgy and a basic understanding of electricity. Interesting, right? Gas Metal Arc Welding will also help us in the application of welding carbon steel pipes components with the use of Gas Metal Arc Welding (GMAW) equipment. Captivated by the given competencies? If not, then check out the other competencies offered by this short course. (8) Fit up weld materials; and (9) Repair welds. Gas Metal Arc Welding NC II can be completed in at least 268 hours of sessions. In some Technical Vocational Institutions (TVIs), they require you to undergo or finish Gas Metal Arc Welding NC I first before being permitted to take Gas Metal Arc Welding NC II so we suggest you inquire first before enrolling. Once you graduate Gas Metal Arc Welding NC II, you may now apply or be employed as a Plate or Pipe welder. There are numerous jobs abroad like in Japan and New Zealand with high salary. Students who are enrolled in the Gas Metal Arc Welding NC II course may be obligated to go through a Competency Assessment before graduation. This is to ensure the issuance of National Certificates (NC II) that will be given to students once they pass the assessment. Vocational Certificate or Short Course Certificate is one of the requirements to apply abroad, especially for welding jobs. You may find more information regarding the assessments and certifications in this link or you can also go directly to the nearest institution in your area for personal inquiries. if i am enroll in tesda gmaw welder how much a tuition fee?